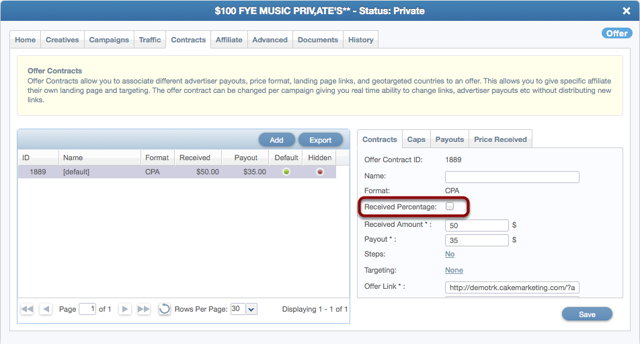 CAKE has 2 ways of setting up a RevShare Offer depending on how your Advertiser wants to pass you your price received for each conversion. Let's assume you're getting half of the value of the Conversion. So, if a Conversion is worth $100, you get $50. If a Conversion is worth $150, you get $75. The default setting when creating an offer is Case 1 where the Advertiser passes your full price received. In this case, the "Received" price listed on the Offer can be any value, but will be overriden by the price passed in the pixel for each conversion (in p). If CAKE is to calculate your price received as a percentage, you will be able to set that up in the 'Contracts' tab once the Offer has been created. With a revshare, the price paid is actually a % value as opposed to a $ amount. So if you are paying your Affiliate 70% of what you get, then you would enter 70. This is not to be entered as a decimal value - 0.70 would be calculated as 0.7% of whatever price received we record. In this scenario, the Advertiser intends to pay your commission on the pixel, NOT the order total. In this setup, the "Received Percentage" checkbox is unchecked and the received price is specified in dollars (or your specified currency). Whatever is passed in the "p=" parameter in the pixel will be used as your price received. 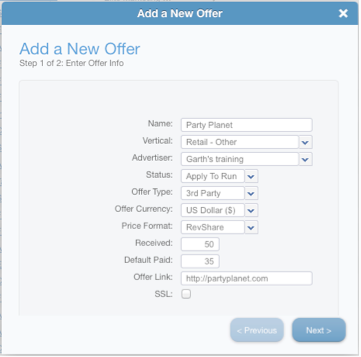 In this scenario, the Advertiser intends to pass the Order Total on the Conversion Pixel and expects that you can calculate your commission within CAKE. If your price received is also calculated off of the Advertiser-passed value, you will check the "Received Percentage" checkbox. This updates the value from a monetary amount to a % value and BOTH price received AND payout will be calculated off of the value passed in the p parameter. ... where the Advertiser would replace PRICE with the code to populate and pass the amount for that transaction. What are Price Formats and How Do I Use Them?